Fan of brunch? These easy brunch ideas will help make hosting a beautiful spread this spring a breeze. Brunch is my favorite for any day, but it’s extra fun to host for special occasions like Easter or Mother’s Day. With these delightful celebrations ahead, it’s time to chat all things brunch. 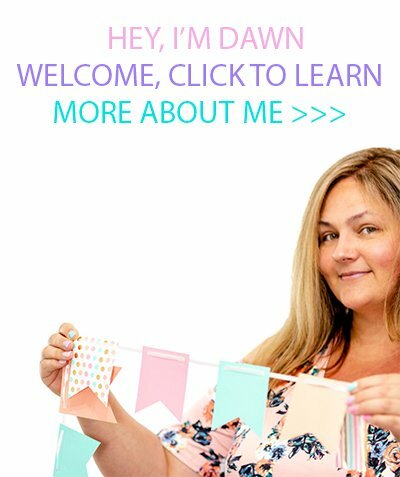 Today, I’m sharing pretty ideas on how to host that are also so easy to do. This is a sponsored post with Cuties®, all opinions are my own. Hosting a brunch is so fun and easy because brunch is seriously so flexible. When planning your brunch menu, defining what brunch really is will be the perfect place to start. It’s a meal loosely defined as being a cross between breakfast and lunch. While it may seem unconventional by design, it means we have more flexibility and the lines are blurred in all the right ways. Generally, I like to lean more towards a breakfast with loads of options with just a small added twist of lunch. The beauty is that you can do it however you want. Brunch can be literally served between the time you would normally eat breakfast and lunch OR it can simply just refer to the kind of foods you are serving. All this to say, brunch is very flexible and you shouldn’t feel limited by it. It’s actually quite the opposite. Think infinite yummy possibilities. Warning, this section is going to make you hungry! Use these ideas to help you into that next phase of planning a brunch party. Let’s get started! 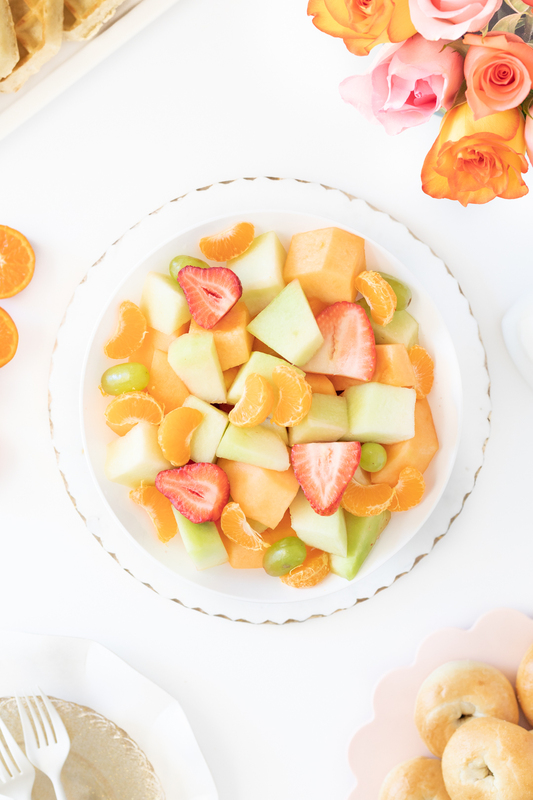 Fruit Salad made with Cuties Mandarin Oranges is the perfect brunch food and also lends to the visual aspect. Other perfect fruits to add include melons of any type, berries, pineapple and more. You can also make it extra yummy by dressing it with honey and juice squeezed from Cuties. Top with mint for an eye-popping twist. Veggie salads – keep these simple. 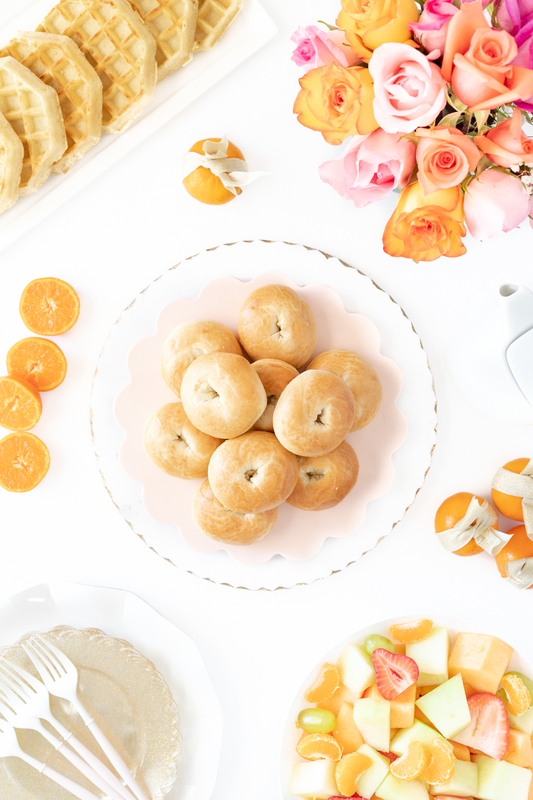 Try also adding pieces of Cuties for a pretty brunch twist. Check out this savory salad made with Cuties. Omelet Cups like pesto omelet cups or bacon and chive. 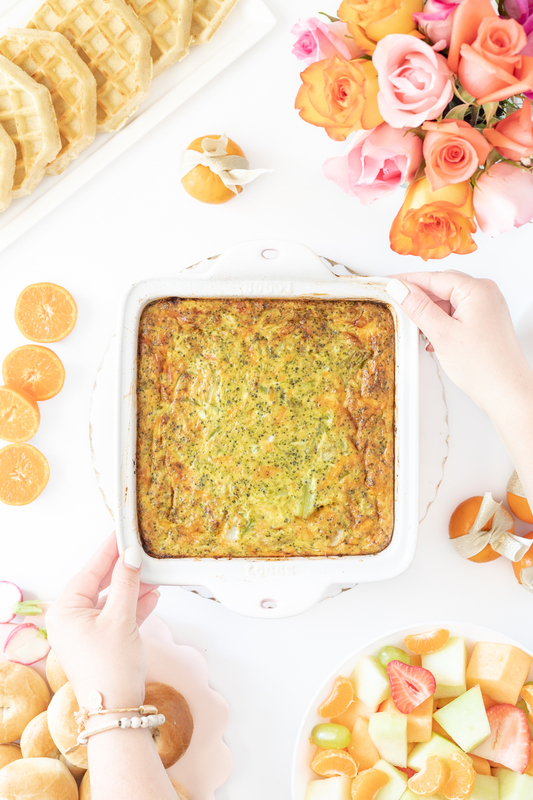 Egg casseroles – load with spring vegetables for a fun pop. Steamed veggies. Asparagus is a very popular brunch food. Breakfast meats like bacon, ham and sausage. Savory more rich meats like slow roasted options such as pork or prime rib if your feeling extra fancy. Bagels, English muffins and toast. Sweet breakfast breads like banana, blueberry and zucchini. Selection of pastries, muffins and donuts. Waffles, french toast and pancakes. Sweet casseroles like stuffed french toast. Yogurt bar or yogurt parfaits like this recipe made with Cuties. Simple desserts like cakes and puddings. Now that you have your brunch meal ideas working themselves out, it’s time to get the table set. Shall we? 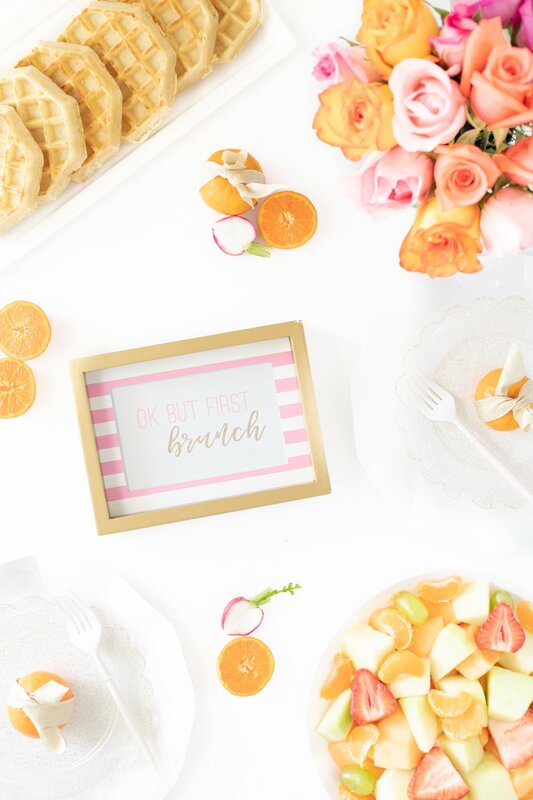 For an easy but beautiful tablescape idea for brunch, I’m sharing a sweet pink and orange colored theme. These simplistic elements come together in all the best ways. Again, we’re leaning to Cuties to help add all the right pops of colors for your delicious spread. We all know how sweet and juicy they are to eat, but they also lend a gorgeous look to your brunch table, too. 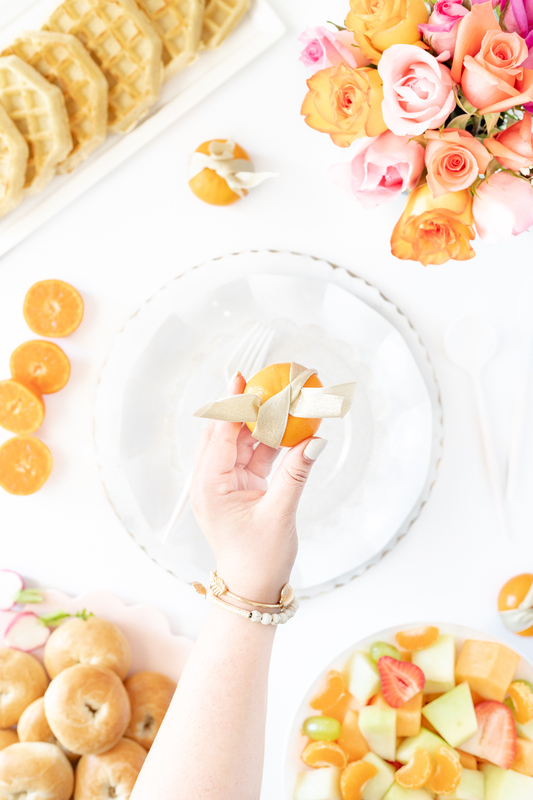 Mandarin orange place settings. For the sweetest simple setting idea, I used a light gold wired ribbon to simply tie around each of my Cuties. Double up on plates. Oftentimes we think of serving food on one plate, but all tablescape pros are doubling or tripling up for an extra gorgeous look. I found the cutest ruffled plates that I use in place of a charger. Then, I placed glittered gold smaller plates on top. Easy, peasy but extra pretty. Brighten your table with matching fresh or faux flowers. I used multi colored roses that included pinks and oranges to match. Create an eye-catching centerpiece. 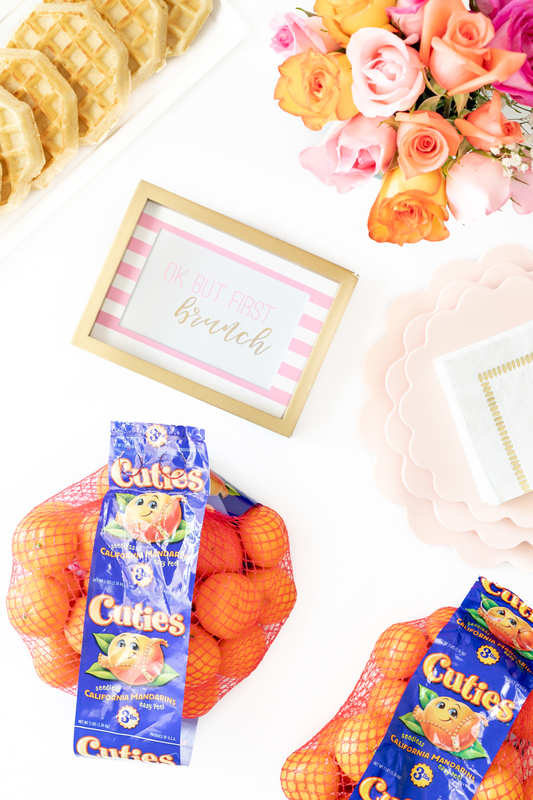 Cuties will also make a perfect focus point at the center of your brunch table You can even simply but them in a shallow bowl or a large pretty jar. So many options. Cuties sliced or halved make for the perfect garnish, too. The options are endless in how you can use them. Brunch can be served almost anytime. Traditionally, it’s the meal between breakfast and lunch by default but it really can be served anytime. It’s really nice to serve a brunch meal for special occasions and holidays. Think Easter, May Day, Mother’s Day and Christmas to start. 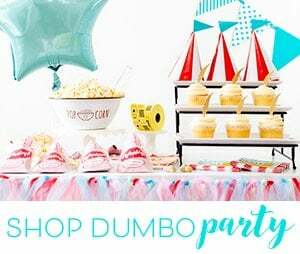 They are also a trendy idea for engagement, bridal and baby showers, too. 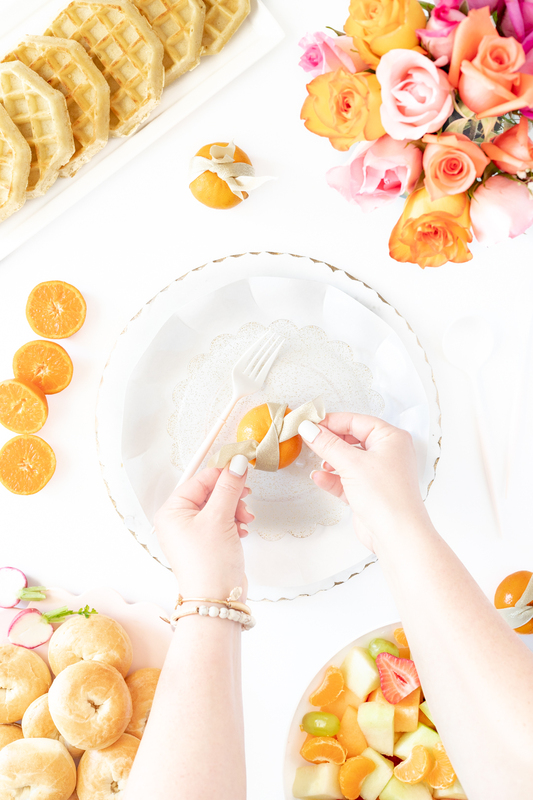 I hope that these simplistic tips help get you started in creating a sweet brunch that everyone will remember! 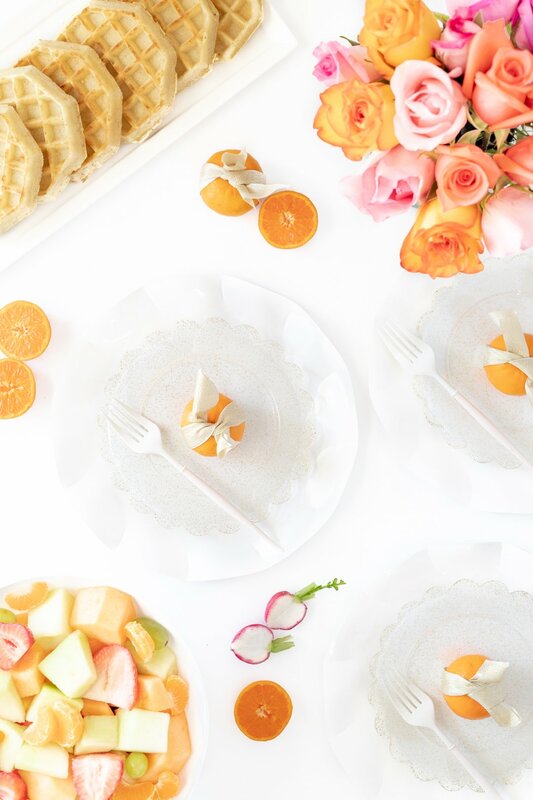 See where to buy Cuties in time to elevate your perfect brunch. Get delish snacking inspiration by following Cuties on Instagram now!